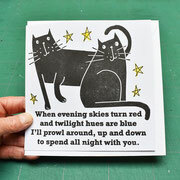 Here is a brand new range of handprinted hand finished signed cards about love. 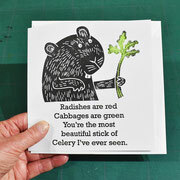 Ideal for Valentine's day or to send a message of love to make you smile all year round. I love writing poems that are funny in a simple way. Each card has a short poetic verse written by myself which has been made into a stamp and the creature featured on each card has been hand carved out of rubber stamp material. Cards can be ordered individually or in discounted multipacks. 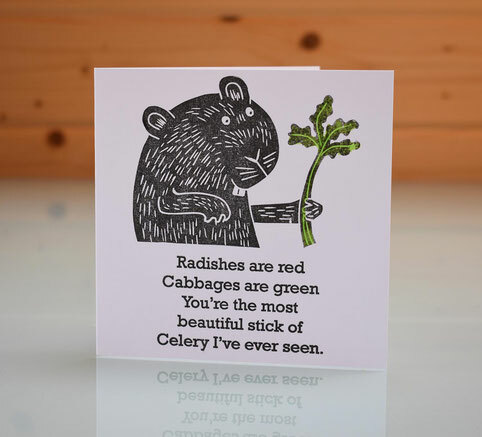 All cards are deliberately left blank inside so that they can be used for any occasion.